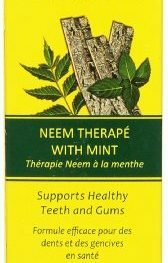 Organix South created this amazing neem toothpaste. It is a real pleasure for your teeth. Real neem therapy with mint. Theraneem mint toothpaste is made with supercritical extracts of neem leaf and neem bark. Made in India, this product has a significant potential in naturals toothpaste brands. But we need to check ingredients to see if deep inside all the great things are some bad stuff. And we did not need to dig hard, and we already found first component concerns. Sorbitol is a sweetener. Not needed in toothpaste unless you want to buy a delicious toothpaste. So you need to decide do you want tasty or healthy toothpaste. Some people consider sorbitol a poison. It is also used in the food industry. But in toothpaste is as bad as is it is in food. Sodium Lauroyl Glutamate is just a lesser version of Sodium Lauryl Sulfate. There are not yet tests done, and we can’t say if it is as bad as it is SLS. But it is also possible that this ingredient can be even worse. Xanthan Gum is actually not needed. Other brands get away without using it, so we need to state a difference between good natural toothpaste and bad. Xanthan gum is a stabilizer in toothpaste. And let make no mistake it is a food additive, so in this case, this is an additive. So this toothpaste has additives. The Interesting thing is that this toothpaste uses Guar Gum. Guar Gum is another stabilizer. And guar gum is much better and safer ingredient than Xanthan Gum. Potassium Sorbate is preservative. So now not only we have additives, but also, we have preservatives in Theraneem mint toothpaste. Potassium Sorbate is linked to damaging DNA. Also, it is a high allergenic substance. Silica is an abrasive element in toothpaste. We have learned that Sodium Bicarbonate is a way better choice for abrasive than Hydrated Silica. Hydrated silica can damage your enamel. Ascorbic Acid is another controversial component. They say that ascorbic acid is Vitamin C. But it is not. Ascorbic acid is artificially made and has nothing in common with naturally occurring vitamin C. Pregnant woman and people allergic to any ingredient in ascorbic acid should not use this toothpaste. It is better to stay on a safe side. Sadly this is one of that toothpaste that tries to be natural but fails. But this toothpaste has good things. It contains neem which is a pretty healthy ingredient that can really help your gums. Also, this toothpaste is sulfate free, fluoride free, paraben free and gluten free. Also, it uses no artificial colors or flavors but still uses some additives and preservatives. From a significant promise, we got a big nothing. Don’t get me wrong; it is still better than any of the conventional kinds of toothpaste. But for a natural brand, we would like it to be more natural.